There are four pool at the resort: two beachfront pools, a family pool with slides and a shallow area, and a hilltop adults-only pool with bar. Offering a beautiful setting on the northwest tip of St. Lucia, St. James’s Club Morgan Bay features a spa and four pools, including a hilltop adults-only pool. 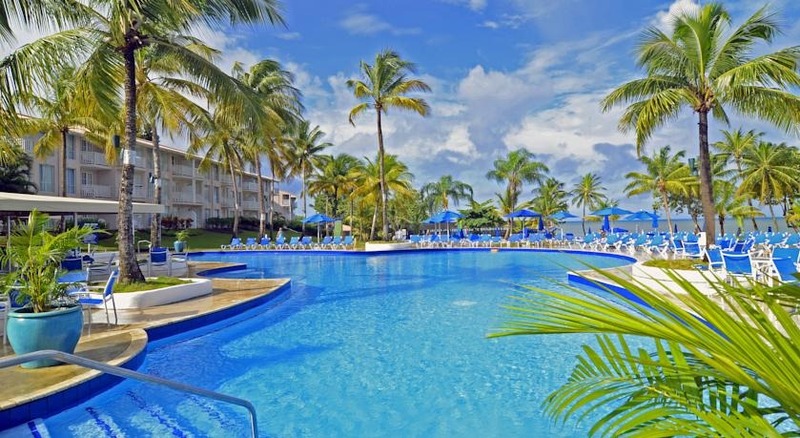 This all-inclusive resort offers eight restaurants and bars overlooking the beach, gardens or pool area. Each air-conditioned room at St. James’s Club Morgan Bay has bright, modern décor. There is a coffee maker and satellite TV. Rooms have balconies or terraces, most with great ocean views. Offering the very best ocean views, the hillside one-bedroom ocean view suites feature a private terrace or balcony that spans the entire width of the suite with panoramic views of St. Lucia’s coast. Dining options at St. James’s Club Morgan Bay include buffet, à la carte and gourmet cuisine. There is also a grill, lounge bar and a swim-up bar. The resort’s newest restaurant, Tree Tops Pizza & Pasta offers made-to-order oven-fired pizzas. The resort features four tennis courts and a range of water sports including water skiing, snorkeling and sailing. There are also volleyball courts, fitness classes and a children’s club. Free Wi-Fi is available in public areas. Fly into Hewanorra International Airport (UVF), St. Lucia. St. James’s Club, Morgan Bay is located about 75 minutes from the airport. Visit St. James’s club, Morgan Bay’s website for more information.